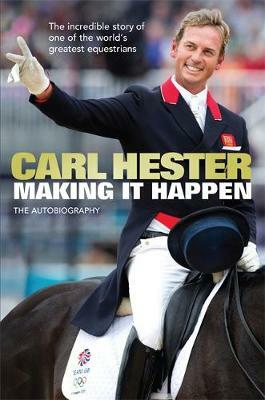 The lively memoirs of dressage rider and Olympic Gold medallist Carl Hester, with a foreword by Martin Clunes. Carl grew up on the remote Channel Island of Sark, moving to the UK mainland at the age of 16 to work with horses, mainly as a way to leave home. He could never have predicted what a great affinity he would have for dressage. Carl's career enjoyed a stratospheric rise as he progressed from working as a groom/rider to riding international dressage horses full time for renowned owners Dr and Mrs Bechtolsheimer, to training his own horses, and other top riders, to international success. Carl's early career revealed someone capable of monumental achievements. He provides a rare insight into both the people and the horses that drove him to victory, initially the skewbald mare Jolly Dolly on which he won the 1985 Young Riders Dressage Championship. During the early 1990s he rode in the World Championships, the European Championships and the 1992 Barcelona Olympics, becoming Great Britain's youngest ever rider to compete in the Games. His riding skills have increased with age, culminating in the hugely successful years as part of the Gold Medal teams that won the 2011 European Dressage Championships and, of course, that made history at London 2012. He achieved both feats on the same extraordinary horse, Uthopia, while as a trainer he produced the even more remarkable combination of Charlotte Dujardin and Valegro. A first-class sportsman and a witty and engaging writer, Carl now offers his admirers the opportunity to read an intelligent, humorous and, above all, inspiring account of his life - from the ups and downs of his career to the motivations and techniques which have helped him to win 66 national titles, represent Team GB at four Olympic Games, two World Championships and seven European Championships, and become one of the best riders - and horsemen - in the world.